Children's Choices Winner, Children's Book Council and International Literacy Association! This fascinating book will stay with children every time they gaze up at the night sky. 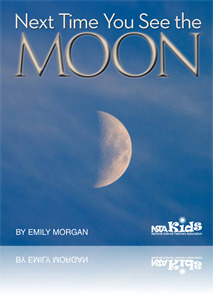 Through vivid pictures and engaging explanations, children will learn about many of the Moon’s mysteries: what makes it look like a silvery crescent one time and a chalk-white ball a few nights later, why it sometimes appears in the daytime, where it gets its light, and how scientists can predict its shape on your birthday a thousand years from now. Next Time You See the Moon is an ideal way to explain the science behind the shape of the Moon and bring about an evening outing no child—or grown-up—will soon forget. Awaken a sense of wonder in a child with the Next Time You See series from NSTA Kids. The books will inspire elementary-age children to experience the enchantment of everyday phenomena such as sunsets, seashells, fireflies, pill bugs, and more. Free supplementary activities are available on the NSTA website. Appropriate both as a read aloud book in early childhood and as an excellent reference for young scientists through age 12. The author explains the science behind the phases of the moon in a succinct way aided by a variety of crisp photographs, including a photographic chart showing a full year of moon phases. As the reader learns the why and the how of the moon’s phases, they gain a strong vocabulary for describing the moon’s ever changing appearance. ... Children will find comfort in knowing more about the repetition of this awe inspiring, yet familiar natural cycle. This book belongs to a series “intended to be read with a child after he (or she) has had some experience with the featured objects or phenomena.” It’s a welcome nudge to put down the iPad and pick up the binoculars. As life at home and school increasingly involve virtual experiences, there’s nothing like starting story time by heading outdoors to look up together. Aimed at the K-6 reader, the book focuses on the mystery and reasons for the lunar cycle. Describing the orbital relationships between sun, moon and Earth isn’t always easy, and the book does a good job. It’s a great appetizer to examining some NASA Apollo mission footage and talking about how we got there—and back.